Reduced Shop Opening Hours in August…. Except for Saturday 12th when open from 3pm to 9pm & open on Sunday 20th August when then shop will open from 12-3pm. Apologies for any inconvenience caused but if you do require wines outside of these hours please call me on 07821 968111 and I can arrange delivery of wines for a small delivery charge from my warehouse. 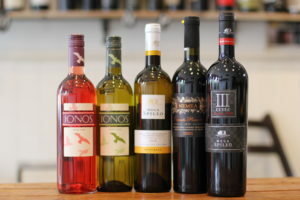 ” Greece is the Word’: new Greek wines here in SW17! We are going back to the roots of wine showcasing some really individual indigenous varietals. They bring to Whirly wines some quality wines at very clever prices which is a much required need nowadays ( fab wines at fab prices, the Ionos white and rose are only £8.50 here in the shop, yes £8.50!). So come on down and support your local small wine importer, there’s no excuse for you now not coming in and tasting some Whirly wines. You can even taste here in the shop before you buy, how many wine shops can you do that in? I have wines at the same price point as my illustrious competitors around both corners and the quality is so much better. In fact I have always had this. I have my wines from La Bouysse in Corbiere that are Organic and Bio-dynamic and they are only £10,50 a litre which works out at about £7.60 a 750ml bottle. So come on down local residents in the Heaver Estate, come on down to Whirly wines and support your local wine business before its too late and I am gone. I need your support! All the wines are from the Peloponnese Peninsula west of Athens. This wine region is an old historic region for wine, the Roditis grape that is the main component of the Ionos white wine, dates back to the 1st century. It’s great to have some new wines and some unusual indigenous varietals from this country, the oldest of the old wine making countries. Varietals like Roditis, Agiorgitiko, Mavrodafni, Muscat of Patras. It’s these grapes that emphasise the importance of Wine today: up until a few months ago Mr Whirly had not tasted these grapes before and they bring something new to the palate, which happens to be a delight, especially if you have some food that you feel would match the wine as I did a few nights ago ( matching the 100% Agiorgitiko Nemea with lamb and Greek feta salad, which was a joy! The menu this week shall show a little Greek feel, so do pop in for a home- made Greek salad with tomatoes and Oregano from my garden soon won’t you, its pretty damn good!